For a happy-path project life-cycle, its essential to have a well defined support structures in place. Without these structures, there won't be any life in the cycle. For a happy-path project life-cycle, its essential to have a well defined support structures - outer & inner circles in the figure - in place. Without these structures, there won’t be any life in the cycle. The most important of these support structure is, undoubtedly, people - its not the latest technology; its not the international best practices; but the right people. If right people are on board, they bring in everything necessary to ensure a success. A tailored process brings a common understanding between the people so carefully selected. Its essential to keep processes, lean and effective. Generally processes are defined by a distant group named in one of the flavors of ‘quality management group’. While its a good idea to have a group centrally own company’s process, its effective if team members are involved in customizing the process. It will bring the buy-in, in the least, awareness. James Bond needs latest gadgets; Jason Bourne does not. A well trained professional can make use of the available tools to accomplish the goals. However, that shouldn’t be quoted to deprive the team of needed tools. 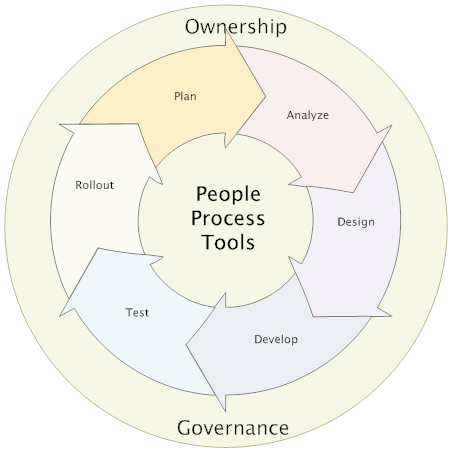 People, process & tools are at the core of successful life-cycles. Projects should not be started without these structures in place. How often projects are started without support structures?